Space, the final frontier of housework. You and your fellow housemates have to keep up with the chores and try to stay alive in a spaceship when Out of Space comes to the PS4 in fall 2019. 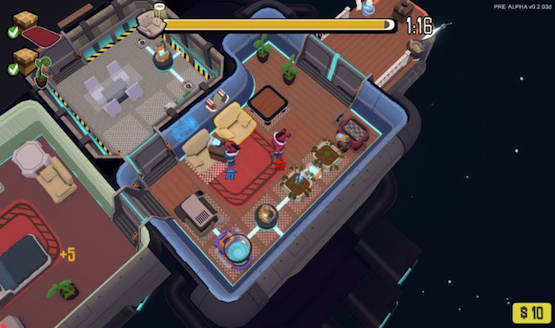 Developed by Behold Studios, who made Chroma Squad and Knights of Pen and Paper, Out of Space tasks players with both keeping a dream home tidy and trying to stay alive in the perilous void of space. When playing with up to four players online or offline, you have to task each other to get rid of the trash, wash the dishes, wipe away alien goo, and more. The idea of the game is that it’s already annoying to assign chores to everyone in a house, but it’s even more difficult in space. However, chores aren’t the only tasks you’ll be doing in Out of Space. For example, you can decorate your rooms and save people who have been turned into cocoons. Behold Studios is a Brazilian studio hailing from Brasilia that began to develop games in 2009. The team’s most recent release was Chroma Squad, which was published by Bandai Namco in 2017 for the PS4 and Xbox One. (Its planned Vita version was canceled.) It’s a turn-based strategy RPG inspired by the Power Rangers, mixed with simulation mechanics as you hire actors, market your TV show, and upgrade your studio with new equipment. Out of Space will be released on the PS4, Xbox One, PC, and Switch, Mac, and Linux with English, Brazilian-Portuguese, Spanish, German, Italian, French, Simplified Chinese, Russian, and Japanese language support. Keep an eye out for it in fall 2019!